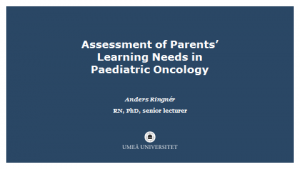 Here’s a list of the references in my presentation, Assessment of Parents’ Learning Needs in Paediatric Oncology at SIOP 2018 in Kyoto. If you want to review the presentation, you can download it and read it again. Darcy, L., Björk, M., Enskär, K., & Knutsson, S. (2014). The process of striving for an ordinary, everyday life, in young children living with cancer, at six months and one year post diagnosis. European Journal of Oncology Nursing, 18(6), 605-612. Gibson, F., Kumpunen, S., Bryan, G., & Forbat, L. (2018). Insights from parents of a child with leukaemia and healthcare professionals about sharing illness and treatment information: A qualitative research study. International Journal of Nursing Studies, 83, 91-102. Greenzang, K. A., Cronin, A. M., Kang, T. I., & Mack, J. W. (2018). Parental distress and desire for information regarding long-term implications of pediatric cancer treatment. Cancer. In print. DOI: 10.1002/cncr.31772. 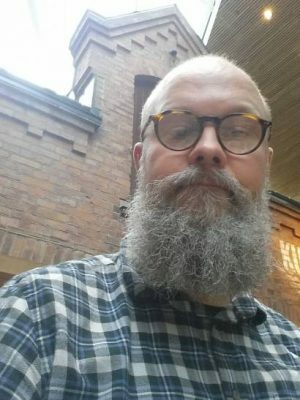 Kästel, A., Enskär, K., & Björk, O. (2011). Parents’ views on information in childhood cancer care. European Journal of Oncology Nursing, 15(4), 290-295. Last, B. F., & van Veldhuizen, A. M. H. (1996). Information about diagnosis and prognosis related to anxiety and depression in children with cancer aged 8–16 years. European Journal of Cancer, 32(2), 290-294. Pöder, U., & von Essen, L. (2009). Perceptions of support among Swedish parents of children on cancer treatment: A prospective, longitudinal study. European Journal of Cancer Care, 18(4), 350-357. Ringnér, A., Jansson, L., & Graneheim, U. H. (2011). Parental experiences of information within pediatric oncology. Journal of Pediatric Oncology Nursing, 28(4), 244-251. Ringnér, A., Jansson, L., & Graneheim, U. H. (2011). Professional caregivers’ perceptions of providing information to parents of children with cancer. Journal of Pediatric Oncology Nursing, 28(1), 34-42. Ringnér, A., Öster, I., Björk, M., & Graneheim, U. H. (2013). Talking via the child: Discursively created interaction between parents and health care professionals in a pediatric oncology ward. Journal of Family Nursing, 19(1), 29-52. Rodgers, C. C., Laing, C. M., Herring, R. A., Tena, N., Leonardelli, A., Hockenberry, M., et al. (2016). Understanding Effective Delivery of Patient and Family Education in Pediatric Oncology. Journal of Pediatric Oncology Nursing, 33(6), 432-446. Rodgers, C. C., Stegenga, K., Withycombe, J. S., Sachse, K., & Kelly, K. P. (2016). Processing Information After a Child’s Cancer Diagnosis—How Parents Learn. Journal of Pediatric Oncology Nursing, 33(6), 447-459. Arida, J. A., Sherwood, P. R., Flannery, M., & Donovan, H. S. (2016). Representational Approach: A Conceptual Framework to Guide Patient Education Research and Practice. Oncology Nursing Forum, 43(6), 781-783. Donovan, H. S., & Ward, S. (2001). A representational approach to patient education. Journal of Nursing Scholarship, 33(3), 211-216. Donovan, H. S., Ward, S. E., Song, M. K., Heidrich, S. M., Gunnarsdóttir, S., & Phillips, C. M. (2007). An update on the representational approach to patient education. Journal of Nursing Scholarship, 39(3), 259-265. Haugen, M. S., Landier, W., Mandrell, B. N., Sullivan, J., Schwartz, C., Skeens, M. A., et al. (2016). Educating Families of Children Newly Diagnosed With Cancer. Insights of a Delphi Panel of Expert Clinicians From the Children’s Oncology Group. Journal of Pediatric Oncology Nursing, 33(6), 405-413. Ingadottir, B., Johansson Stark, Å., Leino-Kilpi, H., Sigurdardottir, A. K., Valkeapää, K., & Unosson, M. (2014). The fulfilment of knowledge expectations during the perioperative period of patients undergoing knee arthroplasty – a Nordic perspective. Journal of Clinical Nursing, 23(19-20), 2896-2908. Rodgers, C., Bertini, V., Conway, M. A., Crosty, A., Filice, A., Herring, R. A., et al. (2018). A Standardized Education Checklist for Parents of Children Newly Diagnosed With Cancer: A Report From the Children’s Oncology Group. Journal of Pediatric Oncology Nursing, 35(4), 235-246. Sobo, E. J. (2004). Pediatric nurses may misjudge parent communication preferences. Journal of Nursing Care Quality, 19(3), 253-262.